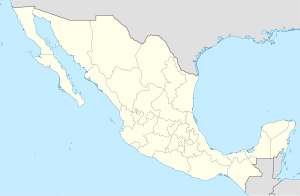 Cuernavaca (kweɾnaˈβaka (help·info); "near the woods", modern Nahuatl pronunciation (help·info)) is the capital and largest city of the state of Morelos in Mexico. It was established by the Olmec, "the mother culture" of Mesoamerica, approximately 3,200 years ago and is designated as the archaeological site of Gualupita I . The city is located south of Mexico City, from which it may be reached after a drive of approximately 1½ hours using the D-95 Freeway. ↑ Wright, Anthony (2009-04-17). "In Morelos, Cuernavaca springs eternal". MexConnect. Retrieved 2009-09-28. This page was last changed on 10 August 2017, at 22:28.